Low-cost, highly liquid, transparent. ETFs meet all your investment requirements. he first ETF was launched in Canada in 1990. Since then, the low-cost, flexibility and transparency of ETFs has led to enormous growth in the assets invested in these instruments. ETFs replicate the performance of an underlying index, for example the S&P 500 equity index in the USA. ETFs are available on indices of equities, bonds, commodities and other asset classes. Using ETFs, it is possible to gain exposure to virtually any asset class, country, sector or investment style globally. As of mid-2015, there were over 4,000 different ETFs available. ETFs continue to break records. Recently, the total invested in ETFs and ETPs (Exchange Traded Products) reached 3 trillion US dollars. 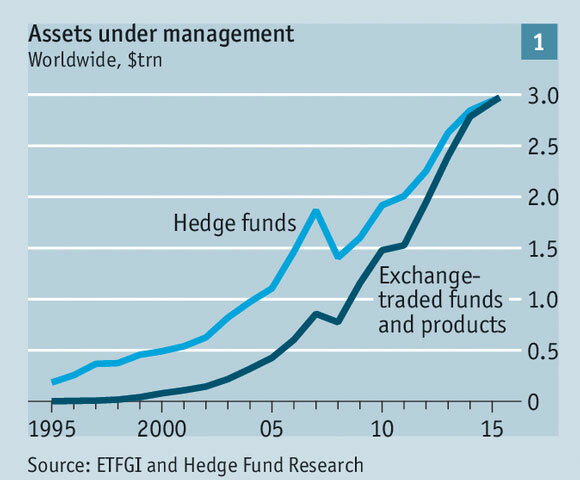 During the second quarter of 2015, ETFs overtook hedge funds, measured by total assets managed. Offering much better value than traditional funds, ETFs typically cost investors 0.1%-0.2% per annum. Using these ETFs, we construct ready-made portfolios for investors of all types. ETFs are highly liquid, meaning there are high trading volumes and they can be bought and sold even in times of market turbulence. All our portfolios offer 24-hour encashment to investors. ETFs can reduce the overall volatility of your portfolio through diversification. Our ETF portfolios are all globally diversified amongst the major asset classes (equities, bonds, commodities etc. ).